Can root vegetables have a starring role in dessert? Yes, absolutely! A few possibilities come to mind right away: sweet potato pie, ginger cookies and the ever-popular carrot cake. There are countless recipes for carrot cake, and for this class I wanted to make a variation that would also showcase another root vegetable, ginger. I enjoy the heat and flavour that ginger adds to a dish, and ginger and carrot is a classic combination. Making small cupcakes instead of a cake definitely makes things easier when it comes to serving time. Baking the cupcakes in attractive decorated liners ups the wow factor, but these cupcakes would be just as good in modest white cupcake papers. 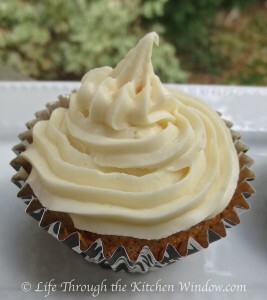 The final flair for a cupcake is the frosting, and in this case I wanted to play up the use of ginger by including it in a cream cheese frosting. This recipe includes two forms of ginger — dry ground and crystallized — to better enjoy its flavour and heat, as well as textural interest from the bits of crystallized ginger root. The result was cupcakes that were moist, flavourful and not too sweet. They seemed to be a big hit at the class, and disappeared off the platter very quickly. Adapted from the blog Sweetapolita.com (Sweetapolita got her recipe from the LCBO Food & Drink Magazine, Spring 2011). This shows how recipes get around and evolve! 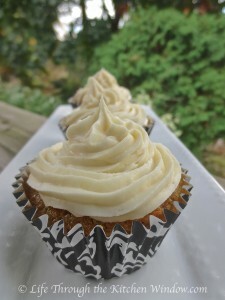 The original recipe was for an orange ginger carrot cake with a white chocolate frosting. I excluded the orange from my version to better showcase the ginger and carrot flavours, made cupcakes instead of cake and topped them with a ginger cream cheese frosting. Note that I shredded the carrots quite finely (using a microplane grater); since cupcakes bake much more quickly than a cake I wanted to ensure they would soften. Preheat oven to 350 degrees F. Line cupcake tins with 18 medium paper liners. Makes 18 medium-sized cupcakes. Stir together all the dry ingredients in a bowl and set aside. Cream the butter, then add the sugar and mix for a few minutes until light and fluffy. Scrape down the bowl, then add the eggs and vanilla and beat well. Scrape down the bowl. With the mixer on low, add 1/3 of the flour, followed by ½ of the milk and repeat until all the ingredients have been incorporated. Scrape down the bowl, then stir in the chopped crystallized ginger, then the carrots. Using a small ice cream scoop or a spoon, fill the cupcake liners about 2/3 full, distributing the batter evenly. Bake on the middle rack of the over for 22 to 24 minutes. To check for doneness, insert a toothpick; it will come out clean when the cupcakes are done. Cool in the cupcake pan on a rack for 5 minutes. Then remove the cupcakes and leave them on the rack until cool. Serve plain or frost with the recipe below. Cream the cream cheese and butter together until smooth and well incorporated. Slowly beat in the icing sugar and then stir in the ginger. You can apply the frosting with a knife or offset spatula, swirling it on, or use a piping bag and the large tip of your choice to pipe it on decoratively.